Google Alerts can result in Political Arrests. Domestic spying on citizens for retaliation, politically motivated arrests, and holding US Citizens as Political Prisoners is wrong. Some nefarious activities are subtle, you have to have a trained eye to see it. When a governors aid puts a list out, it might mean investigate, pass the names, photos, and information on target subjects and then arrest on sight. I just found [this link], and will add to this post as I discover more. 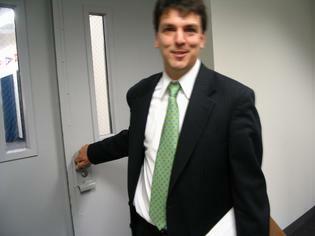 Kenneth Krayeske was the former Green Party Campaign manager for Connecticut Governor. If you are critical of Governor Rell, you are might be part of a Google Alert, chain email, or your letter to another politician, or even a letter to the editor critical of Connecticut Governor M. Jodi Rell, the Connecticut State Police Goon Squad, members of the Judiciary, and/or Organized Crime Figures, can put you on the Connecticut State Police Secret Enemies list. If you check out the link above, a staffer in the Governor's office email the Connecticut State Police the list of bloggers. It is assumed that the police were to target, maliciously investigate, harass, threaten, stalk, ruin the credibility, ruin relationships, cause job loss, loss of home, credit, break up target's family, and arrest target on list upon sighting. That happened to Ken Krayeske [story] and it happened to me and many others. It is happening nationwide, and the long arm of the abusers in this country, even target citizens in other countries for retaliation and to squash their exercise of Free Speech. I used to blog on Freespeech.com, until 2006, a day after the below video was posted. Freespeech.com went down. There was an electrical surge at the server location, a home near Atlanta, Georgia. Everything electronic in the house fried. I was staying at a horse farm, just above Connecticut, after I sighted two Connecticut State Police cruisers outside where I was staying, they saw me, the following day, there was a power surge there that took out everything electronic in the house, televisions, the furnace, microwave oven, and other items. Around the same time, the same thing happened to Chris Kennedy, in Ellington, Connecticut, but not to his neighbors. Chris Kennedy had also complained to Governor M. Jodi Rell's office about Judicial, Police, and official misconduct, and public corruption, in the State of Connecticut. To share this post with a friend, click on white envelope below. If you come upon this post alone, click on top banner to go to newest and other posts.